i made it but i tweaked it a little. I dont like peppers so they went out. I added some garlic with my onions, just a little. We had a family member who doesnt do pork so we did chicken sausage instead of the ham and I used egg beaters instead of eggs and milk, a large carton. I put a little extra salt and pepper and diced some tomatoes out of the garden am mixed with my potatoes.It was pretty good. Needs something else though.I am thinking next time add some salsa green chilis maybe. Everyone said they liked it and several asked for the recipe. You can add what ever you like to it. I am thinking bacon instead of ham or sausage or maybe some spicy sausage. Hope you don't mind me asking if there is a way to reduce the recipe to 4 or 6 serves? I'm not used to the crock pot but this looks fabulous!!! Thanks for sharing! i will try once again as it seems to be a great item..
With all the super hot days we've been having, I'm going to try this crockpot dish! It looks delicious! 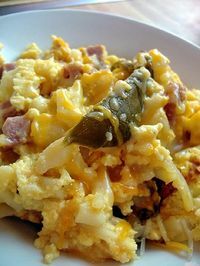 I should try for Eggz-N-Taterz Crockpot Casserole.It sounds tasty. 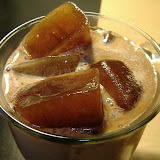 Here i will give a recipe for chocolate coffee with cream. 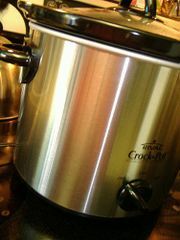 Daddy bought a new crock pot for Mama? Nice. The recipe looks delish, I will add it to my collection of CP recipes, thanks. Christine, Happy 4th of July to you and your family.